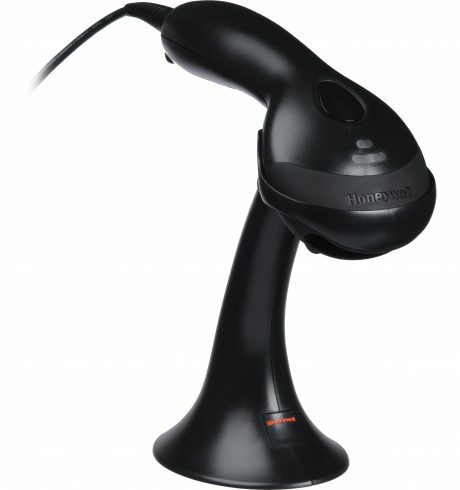 The Voyager 9520 is Honeywell’s best-selling hand-held scanner. Its popularity is based on particularly reason­able prices, high scanning efficiency and a universal field of possible applications. With its futuristic housing and clever arrangement options the scanner excels everywhere – at the cash desk as well as in the warehouse, workshop or laboratory, thus making it fit for any application that requires scanning of barcodes. The integrated laser unit recognises barcodes even from twenty centi­metres distance, making it very convenient for users to use. The scanner does not have to touch the barcode – even barcodes on warped surfaces can be scanned without problems. The projected laser beam is clearly visible on the object surface for indicating the exact scanning location. The included scanning stand turns the handheld reader into a stand scanner for desks and counters. Instead of holding the scanner onto the barcode, the user just holds the scan object right in front of the scanner. An infrared sensor activates the device automatically to ensure easy operation with just one hand. Then the barcode is scanned at 72 scans per second, automatically decoded and transferred to the computer. The integrated decoder’s diverse options make the scanner suitable for all possible hardware conditions. In a matter of seconds users can adjust various options, such as field separators, transfer speed and interface parametres. Programming these functions is made easy with included barcode tables, or with a few mouse clicks in the user-friendly software interface. For programming on a computer, a serial cable is required. Based on the standard Voyager 9520 version, Honeywell offers further models, to always be able to provide you with the right scanner to meet you needs. An example is the Voyager 9521 HD – identical to the performance of its basic model, it is capable of scanning high density barcodes in addition to standard 1D barcodes and RSS codes. Such barcodes (minimum module size of 0.076 mm or 3.0 mil) become necessary when extremely small barcodes have to be scanned, for instance on jewellery, circuit boards, or electronic components. Honeywell scanners using the keyboard wedge interface usually work properly with the power supplied by the PC keyboard port. However, some PC mainboards do not supply sufficient power, in which case simply order the additional power supply »ms9520nt«, compatible with all Honeywell keyboard wedge scanners.